(Okay, maybe I'm the only one.) In 2003, a Bigfoot-like creature known as a mande burung was spotted in the jungles of rural India. 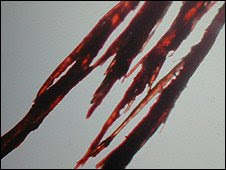 Later, a local researcher named Dipu Marak visited the site and discovered a number of unusual hairs (shown below). He in turn gave the hair to reporters from the BBC, who decided to have a few tests performed. The first set of results are in. After examining the hair under a microscope, experts say that the strands DO NOT appear to have come from any animal commonly found in that part of India. In fact, the only samples that appear to match the strands Marak collected are those of "Yeti" hair brought back from the Himalayas by Sir Edmund Hillary. The mande burung hair is now being sent for conclusive DNA analysis. Could we soon have evidence that a previously unknown primate exists in the forests of India? Could it be the ten-foot creature with black and white fur that residents of the area have been reporting for decades? Cross your fingers. And read more here. On a side note, if the British scientists are interested in Bigfoot-like creatures, perhaps they should check out their own backyard. The Grey Man of Ben MacDhui is an ape-man that's said to roam the second highest mountain in Scotland. YEAH!!! 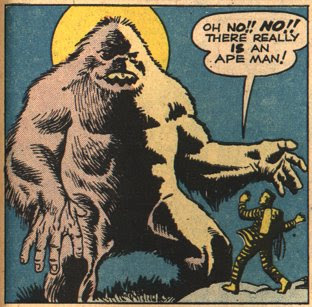 A post on Bigfoot! You were definitly not the only one who was waiting for it. The part about The Grey Man of Ben MacDhui sounds very interesting. That's cool! Maybe they should make a yeti/bigfoot museum. I could get my school to go there for a class trip. COOL!!! That is awesome! I am glad they are finally getting legit proof! This is a huge break through. speaking of south asia, has anyone read born confused? it's pretty good, although books where romance trouble occurs stresses me out unless it's in the twilight books. then i'm just plain addicted. speaking of twilight, i was at the breaking dawn release in portland oregon! thats only a 5 hr drive from Forks! i still havent convinced my dad to drive me there, but i wont give up. was anyone else there? oh yeah!!! I'm a huge fan of the "yeti" or "bigfoot" or watever u choose 2 call it!! !